In Pleasanton, California this couple chose the Palm Event Center for their wedding. The couple were looking to design a classic-romantic look. For the bride we designed an elegant bouquet in all white which included: roses, calla lilies, and mini cymbidium orchids. The wedding ceremony was set using a wine barrel backdrop, the aisle lined with romantic floating candles. At the mouth of the aisle two wine barrels were placed to hold two white low floral arrangements and another two barrels at the altar. At the wedding reception, tables were decorated with two types of centerpieces both tall and short glass vases. 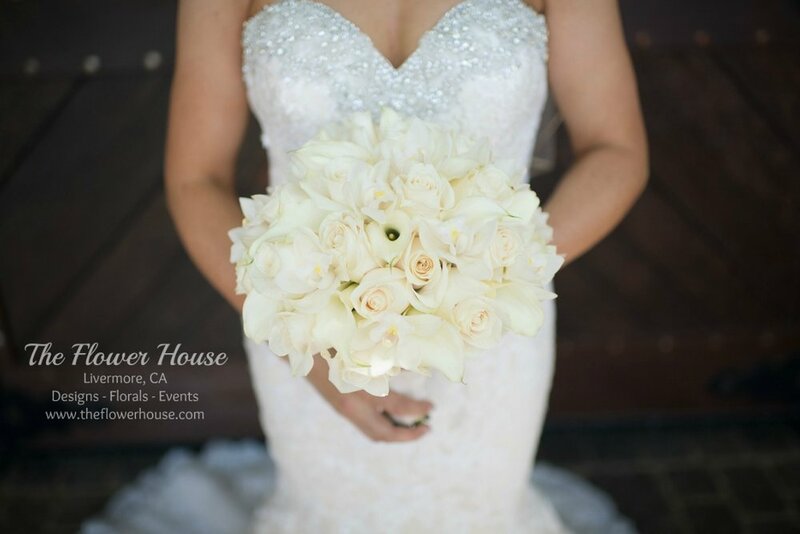 The lush arrangements were full of white hydrangea, white roses, stock and eucalyptus.